As a new student to the School of Law, you are joining an extraordinary community that values the learning process and the learner. All new students will receive an “Intent to Enroll” form by email from the law school's Office of Admissions by mid-May, unless admitted thereafter. Completion and submission of this form is the final step in accepting our offer of admission. Failure to submit this form will result in a forfeiture of your seat. All newly enrolling three-year J.D. students are required to send a final copy of their baccalaureate degree-noted transcript to the Law School Admission Council by July 15. (Access the Transcript Request Form by logging into your LSAC.org account.) Failure to submit your final, degree-noted transcript will prevent fall course registration and attendance at orientation. If you will have completed all baccalaureate degree requirements, but your degree will not be conferred until after July 15, please notify the Office of Admissions at 716-645-2907 or by email to law-admissions@buffalo.edu immediately to request an extension. (Documentation from the degree-granting institution may be required.) If an extension is granted, you will be permitted to attend orientation and begin classes with the understanding that a final, degree-noted transcript will be received no later than October 1 per American Bar Association Standard 502(d). If you fail to submit a degree-noted transcript by October 1, you will be resigned from all courses and responsible for tuition charges. All students must provide an official record of their measles, mumps and rubella immunity — and meet the meningitis requirements and have cleared all other holds on your record — before registering for classes. Specifically, all incoming students (undergraduate, graduate and professional) born on or after January 1, 1957 must: 1) Provide proof of immunity against measles, mumps and rubella; and 2) Receive information about meningococcal disease, and make an informed decision about whether or not to receive immunization against meningococcal disease. To learn more and access required health forms, visit UB’s Immunization and Meningitis Requirements. After you have access to both your Person Number and UBITName, you will receive an email with your One-Time Password. (If you are a former University at Buffalo student, you will not receive a single-use password. If you don’t remember your old password, contact the UB CIT Help Desk at 716-645-3542). Once you receive your One-Time Password you will need to Activate Your UBITName. Doing so will grant you access to a vast array of campus services, including MyUB (the University’s web portal) and UBmail. Our academic requirements, policies & code of student conduct provide law students with critical information regarding graduation requirements, curricular guidelines, and academic integrity. New students will be required to sign the GARP during orientation thus should review it carefully in advance. 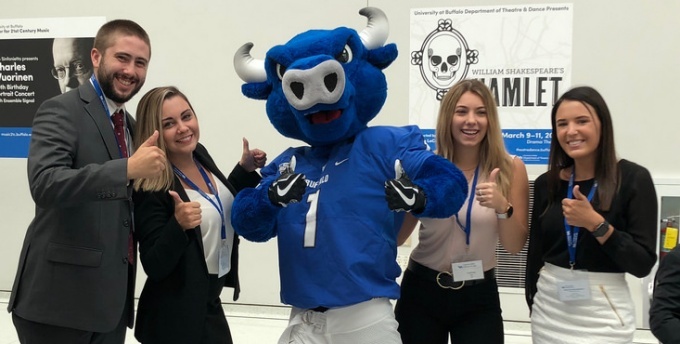 Your UB Card is your official University at Buffalo ID. You will be eligible for a UB Card once you have been registered for courses. The cost of the card is $23.50, which will be charged to your University Account. To avoid long lines, we recommend obtaining your UB Card prior to law school orientation. The UB Card Office has two locations on campus. Call in advance for hours of operation. The recommended summer reading list is a compilation of books recommended by School of Law faculty. Some may be of particular interest to newly accepted students, international students, and others. Note: This is not mandatory reading! The School Information Portal (SIP) is the School of Law’s official communication channel to students, where students can find much of the information needed in one spot. For that reason, you should check SIP regularly. New students will be added to SIP by early-August. Have You Already Completed This Course? If you have completed this course in the past, please fill out the Help Form. A Health Promotion staff member will help to determine if you are eligible for exemption. Books and materials can be ordered through the University Bookstore, located on the North Campus. It is imperative that you secure a UB parking permit for your vehicle prior to orientation. You may do so after you have been registered for fall courses by ordering it online through MyUB, or in person at 106 Spaulding Quadrangle, Buffalo, NY 14261. Learn more by visiting UB's Parking and Transportation Services.